Binary Scam Alerts » Scam Reviews » Auto Binary Signals Review, SCAM Or Legit Signals App? Welcome to our Auto Binary Signals scam review and investigation. If you have searched the internet looking for a detailed and factual review about Roger Pierce and ABS, you have found it. Our staff has recently received some queries and possible complaints about this Auto Binary Signals software, and we finally decided to dig in deep and get the facts before deciding if it is worthy or should be blacklisted it. We know some of you may think this software is a fake signals solution and not genuine or legit, this is completely understandable. However, we have been able to collect some information which may ease your concerns. To be honest, we didn’t like everything we saw here, but as long as we are being truthful, there are a few features that exclude ABS from answering to the traditional SCAM criteria, and we will discuss this in detail. First of all its worth pointing out that despite it’s name ABS is NOT a trading robot, these are manual signals which have to be downloaded to your computer. There is NOTHING automated here. Secondly, unlike other software this one requires a setup fee in order to be able to access the app. Keep reading to see how we examined this software and why we believe Auto Binary Signals is NOT a SCAM, despite the fact that it is being heavily promoted by affiliates using aggressive email marketing tactics. ABS is one of the oldest and well-known manual binary options signals systems which requires downloading a software. Once you are done downloading it you are required to fund a trading account in order to start trading. The software is presented to us by Roger Pierce who claims it “exploits Unknown Loopholes and provides Guaranteed Returns”. We neither like nor believe this form of hype, and this lit up a red light for us, still we kept an open mind conducted a full systems check. We have taken a couple of screenshots which represent the core features and elements of the software. So we will simply refer to each slide and explain in details the pros and cons of each one. Here’s a screenshot of various brokers, and its clear to see that three out of the four chosen brokers are not in business any more. Furthermore, at the time these brokers were known to have a very dubious reputation. XP Markets, Optimarkets, and Trader XP were at the forefront of scamming day traders and defrauding them by stealing their credit card information and overcharging customers. Optionrally has a checkered past and currently holds a Belize License. The broker itself was an industry leader however it had to forego its CySec license due to a variety of violations, primarily having to do with false or misleading advertising tactics (but not only). Now, lets examine the Trust Guard seals, this is something we consider to be extremely important. The fact that it is real and there are real people and a company behind it provides this software with an advantage where other providers fail. The support email is real and also responsive as well as professional. The staff is kind and courteous without being too pushy. The daily performance is updated religiously on the ABS website. These results are very difficult to forge or manipulate, so we do believe that it’ definitely a plus when you compare it to other systems available these days. Finally, the 60 day money-back guarantee exonerates ABS from the classic scam category, and it’s clear to see that you can actually get a refund from ClickBank (where the software is sold). However, as we previously mentioned it does not mean you can get your money back from the broker and that is where the real money is. “The code to financial success has been dissected, deciphered, and laid bare.” Roger Pierce and his secret software exploits unknown loopholes for guaranteed returns. No complex charts or baffling analysis. The sales video claims you can launch your assault on the binary market within 15 minutes or less, and make thousands of dollars on a daily basis. The presenter of the sales video says Auto Binary Signals are crash proof, recession proof, and fool proof. Again, this is really hyped up and we can’t even begin to explain how misleading and deceptive false advertising like this can be. Pierce claims the software allows you to “siphon off $76 in 72 seconds”if you believe that. This feature makes sure only the best trades are executed since balance and stability are crucial in binary options trading. It is the ultimate risk management system. MPMIS: Multi-indicator system with trading precision. Supply and Demand price predictor. Super Accurate 80-100% leading Call/Put signals. He graduated from London School of Economics (LSE) and was immediately hooked on trading when he started to work for JP Morgan. He was very successful until the stock market crashed in 1987 and it all changed. After that he moved to New York and managed financial software for one of the world’s largest hedge funds on Wall Street. Since then he has shifted his investment portfolios to binary options and has never looked back. This is a very hyped-up sales video which promises you can make thousands of dollars in a matter of seconds. The biggest mistake these guys did is use a massive amount of inflated bank accounts as a kind of “proof” the software is successful, but the numbers are extremely exaggerated. We also don’t really know who Pierce is, but we do appreciate the security features. The testimonials can be fake, and the Facebook comments are not clickable so we can’t really validate any facts. In short, ABS is what we refer to as a borderline case. No, it costs $115.43 and that is just for the software. It will cost you another $250 (minimum) in order to get started trading with a broker. So while there is a refund on the software, the really big money is your investment with the broker (which may or may not be regulated) and some of these guys have a notorious reputation for stealing money. The hot scams topping the complaints charts are Infinity App and Quantum Code. If you are not quite sure about how to proceed or which system is right for you, then you are obviously not the first or last one to feel this way. Our staff of researchers has compiled a short yet promising list of the best and most consistent money-making machines. These are proudly showcased in our recommended section. Review Conclusions and Summary – Blacklisted or Legit? The Auto Binary Signals software by Roger Pierce is a classic example of a borderline SCAM. There are various indicators telling us that it is a malicious SCAM, while other factors seem to signal to us that we are dealing with a genuine signals solution. 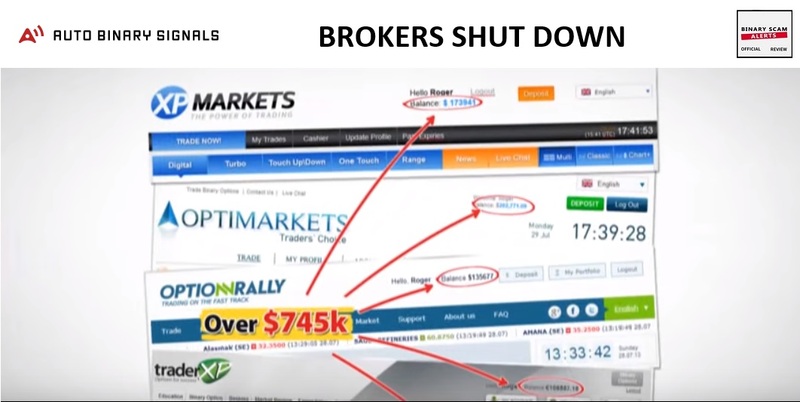 We didn’t like the fact that the brokers they chose are closed down as this indicates the software is antiquated and out of touch with recent industry changes. We do however like the security seals and the constant updates of the trades which are executed. Everything considered we can’t recommend this software, but it doesn’t fall into the classic scam category so for the sake of honesty and transparency we have presented you with all the relevant facts and will let you make the final decision about joining Auto Binary Signals or not. As always, don’t forget to join our Facebook group and subscribe to our YouTube Channel and get informed.